Q: I have received the excerpt from your vertical jump manual which looks great. When do you anticipate having it available. Can you tell me what it will cover? Do you offer any other basic programs or can I only get them through a consultation? Lately I have received many questions about the upcoming vertical jump manual and I am now happy to say everything is completed except for the pictures. I am not going to make any promises as to when exactly it will be available, but the most difficult and time consuming parts are completed so it should be fairly soon! As for what it covers practically everything. It is designed to take the cookie cutter approach out of program design and set-up. It will practically serve as your own trainer and should answer every question you could ever have on the subject. Much of the information will carry over into other activities as well such as speed and agility training. It incorporates 15 or so different programs with each program customized specifically for a particular level of advancement or training need. You pretty much plug yourself into the assessments and out spits several program options custom made for the individual. I go into detail on a lot of things and explain the how's and why's for everything - in fact the science part alone without the programs is over 120 pages so it should entertain the information seekers. For those who just want to use the programs and skip the scientific stuff it definitely has plenty of them to keep you happy for a long time. As to your other question about other programs I will offer, - by the end of the week I will be offering a 30-day jump training program and a 30-day speed training program for $20 each. I generally don't like offering non-individualized programs but enough people have expressed interest that I decided to start offering them. They are flexible enough that everyone will benefit. When these new programs are ready I will announce them under a new section of the website titled "announcements" so stay tuned this week. Ok the reason your ground contact times are long is probably because you're "trying" too hard to exert force. 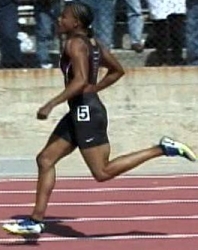 Sprinting is a reflexive activity. As you run you can anticipate the ground contact phase and prepare your body ahead of time but if you try to voluntarily do anything during the ground contact phase itself you will just mess everything up - and this becomes more important the faster you go. You can often get away with bad mechanics during the initial acceleration phase which is a reason why a lot of athletes who don't do any sprinting can still be fast out of the gate. Yet get past 30 yards out and you'll run into problems. Let me give you an example to describe what's probably going on. Have you ever ridden a scooter? Imagine taking off on a scooter. As you accelerate you reach ahead with your foot,"dig in" and pull. However, what happens if you try to do this once you get going at a really good clip? Once you reach a certain speed you just slow yourself down by trying to grab and "dig in". When you get going the only way to go faster is by applying very short quick strokes nearly straight down into the pavement. Sprinting is the same way. The faster you "try" to go and the more you reach the further ahead of your center of gravity your plant leg will go. This will actually create a braking effect thereby lowering your hips and increasing your ground contact times. Your trail leg (recovery leg) will also tend to fold up too far behind you instead of directly under you because your lead leg is reaching. Here are a couple of tips. Just focus on relaxing and pushing down into the ground with each stride instead of reaching out. The only thing you should be aware of is pushing down. To help prepare your body to accomplish this your recovery leg (the leg coming off the ground) should swing up nearly directly under you instead of way back behind you. In other words, don't let your trail leg get too far behind you. Practice this drill known as the wall slide. This drill will help improve your backside mechanics. Imagine a wall of glass behind you running straight down your backside. Your heels must not break the glass. Your foot should be pointing down with your big toe cocked as the foot of your recovery leg passes over the knee of your support leg. In fact, at high speeds you should concentrate on nothing but stepping over your support knee and relaxing. Do this and you should immediately notice big improvements. Here are a couple of pics. Try to work on getting your foot tucked more under you like the first pic and less like the 2nd. Q: What type of training schedule would you recommend for an amateur boxer in the cruiserweight division looking to focus on improving his anaerobic strength-endurance within a two-month time frame?Thank you. I won't have room to cover everything here but I will answer your question pertaining to anaerobic endurance. First, let me tell you that when dealing with fighters I don't use too much of the traditional activities like roadwork. This work is OK to keep your weight down and for general fitness, but to acquire boxing specific endurance requires something more. You need to be able to go through 3 minutes of hell and recover nearly completely within 1 minute. This means your lactate threshold, or the intensity at which you can go before lactate (the burn) builds up and stops you, must be improved. During a round of boxing your heart rate will reach 180 or more beats per minute. Not only must you have enough anaerobic endurance to tolerate this but you've also got to be able to reach near full recovery in 1 minute or less. Recovery between rounds is paramount and does rely on general cardiovascular fitness but if your boxing training is anything typical you should get plenty of that with the rope skipping, shadowboxing, etc. that comes with your regular boxing workouts. To improve anaerobic-endurance I recommend 2-4 sessions per week of specific anaerobic threshold training. Let me give you a few examples of some workouts you can use. Sledgehammer Strikes- Get an old tire and a 10 or 12 pound slegehammer. Hit the tire vertically and diagonally from both directions. Go as fast as possible and as smooth as possible while emphasizing core rotation. You should get a minimum of 40 strikes per minute. You can do this a number of ways. You can go for time, number of strikes, or for rounds. I like to go in 3 minute rounds with 1 minute rest intervals incorporating shadow boxing. The important thing is that over time you decrease the rest intervals while increasing the speed and work duration. So, you might start out at 6 rounds x 3 minutes with 1 minute rest intervals and work up to where you can go 10 rounds x 3 minutes with 30 second rest intervals. Explosive Sprint Intervals- Perform 20 plyometric pushups immediately followed by 10 jump squats - Next, immediately sprint 200 yards followed by 20 more plyometric pushups and 10 jump squats followed by another 200 yard sprint. After this rest 1:30 and repeat the entire complex. Start off with 4-5 complexes with 1:30 rest working down to as many as 10 sets (depending on the length of the fight) and :30 seconds rest. Javorek complexes- This is a good finisher workout to use after a strength training session. Grab a fairly light barbell with about 60% of your 1rm curl weight. Do the following movements all in succession without any rest. This will be the most boxing specific workout. When you can perform this sequence repetitively for as many rounds as your fight you'll have more then enough endurance to make it through a fight. Preferably perform this drill on a grassy field. The 3 minute drills consists of 3 minutes of combinations of sprints, skipping, hopping, jumping and other various bodyweight exercises done at full intensity. Start out with only three, 3-minute drills with one minute rest between each and gradually work up to six 3-minute drills with one minute rest between. Take your pulse after each drill (target: 180 bpm), and again after one minute rest (target: 110 bpm). Bear in mind that this drill is NONSTOP -- push yourself to the limits of your anaerobic tolerance. Move as explosively as possible on all the movements including every step you take, every jump, hop, skip and start/stop. You can alternate these workouts throughout the week just make sure you do a minimum of 2 and a maximum of 4 in conjunction with your regular workouts. Q: I've just found your website and I must say it's great. I've always searched to improve my vert, and read alot on the net about it. But now I am in doubt. I'm 5'11 (1.81 m), 150 lbs (68 kg). I am a one-leg jumper. The fact is that, under no circumstances, am able to jump off two legs. I just can't and don't think there is a way to train it. It's like my weight center doesn't allow me. I surely jump higher two-legged standing than if I take a pre-run and "set" my feet (that is a little jump before the two-legged jump). I feel very natural to jump off one leg, but only with my left one. If I jump off my right one, like trying to dunk left-handed, I can't jump. I think this has to do with the two-legged jump also, since the right leg gives the main power when jumping off two (the left leg is in front of the right one - I'm right handed). I have recorded the highest jump off one leg at about 43 inches (1.09 m) when properly warmed-up, with the right shoes (ones that can give me the grip (without grip I can't jump at all it's like a limitation my body emposes when I feel the floor slippery)), but my average vert off one leg is like 36 inches (90 cm) at 17 years old and now, at 19 and 1/2 years old I guess it might be around 32 inches (80 cm). My standing two-legged vert is around 24 inches and my so called running two legged vert is around 20 or maybe lower. I have great top speed when it comes to running but bad acceleration. Now the question is... what can I do? Never did plyometric training as it is (except for playing and trying to dunk and stuff), but did weight training just as a beginner. I tried some plyos but I see them as being unuseful, like they are doing nothing on me, even though I tried to be as explosive and nervous on each repetition. My opinion is that plyos should help me since I'm lacking acceleration but... The second question is about weight training: I know that training in the 6-8 repetition range trains most of the IIB fibers (the white glycolitic ones - the fastest of them all). I also know that in order to jump higher you need to be explosive etc. But now it comes to this: Let's say I want to squat. So I go for a weight that I can lift for a minimum of let's say 5 reps up to a maximum of 7. This is supposed to train the IIB fibers. But I can't do the repetitions explosively due to the heavy weight. Then if I choose a lighter weight and do them explosively, I go more than 7 repetitions so I'm not targeting the IIB fibers. What is the correct choice for explosiveness or at least having the IIB fibers developing and aiding to my take-off power? Ok that's quite a mouthful there but it's all really simple. It can be summed up in 5 words - You need to get stronger! That's your answer but let me get into some specifics. Your 2-foot takeoff jump is more dependent on voluntary strength then it is reflexive ability. When you run and jump off one-leg all your muscles are really doing is stabilizing. So you probably have good reflexive efficiency but lack voluntary strength. When you approach the basket and execute a jump stop you have to nearly instantaneously absorb and gather forces equivalent to around 6 times or more your bodyweight. What would happen if you took a 90 year old woman and had her do a depth jump from a 3 meter box? She would crumple to the ground upon impact. Why? Because she doesn't have enough muscular strength to absorb and transfer the stresses. Will specific plyometric training work for a weak person? Not very well because there's not enough stiffness in the spring to support it. That's why you didn't notice anything when you did plyometrics. You're muscles are like loose springs that need to be stiffened up. Also, when I talk about plyometrics I'm not just referring to exercises designed to increase power, I'm talking about exercises that will enable one to move correctly. You see, all sports movements are or should be plyometric...the movement is generated with the muscles acting as stabilizers and the tendons and non contractual tissues acting as movement generators. Most all great athletes (well at least in speed-strength dominant sports) have this ability but the average athlete needs specific work in this area. So often I will initially use drills in order to drive home the correct movement patterns and then add superior power and strength to those movement patterns. So going in the weight room and getting as strong as an ox is the definite answer for some (like you) but there needs to be a caveat attached to that. Strength is not worth a whole lot without the ability to move. Watch the progression of NFL lineman over the next 5 years and that will probably become clearer. Once you can move correctly you then need to be able to add horsepower to that movement and this is where it sounds like you're exactly at right now. You're able to move reflexively enough so what you need now is to add some horsepower. You can gain that from either increasing plyometric strength (not the same as plyometric movement efficiency) or increasing muscular strength. In your case it's obvious you need muscular strength because, like I said, unless you have enough strength to absorb forces you won't have enough strength to react to forces and from the way you describe your jump stop it sounds like you're struggling in that area. This is further supported by what you say about your sprint times. As for fiber type and weight training don't worry so much about that. Improving your strength by lifting in the 7 or less rep range will recruit and strengthen all of your various muscle fibers. With loads of less then 30% 1rm the IIB (or IIX fibers) are more responsible for the outcome but they are also recruited with heavy loads as well. So to sum it up, get stronger and your 2-legged jump will improve without even practicing it. With a little practice combined with strength it will improve even more.